I purchased these two machines a few years ago. It's amazing how much easier, efficient, comfortable and safer they make it to perform repair jobs. 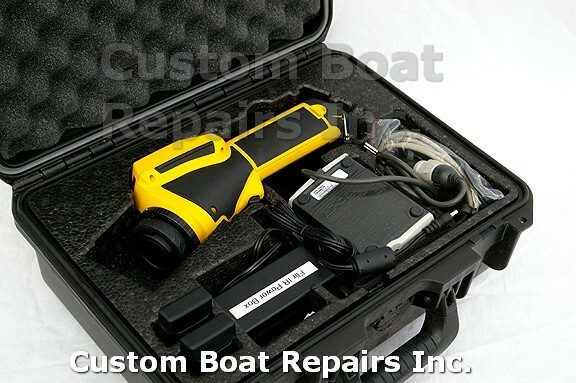 Following are a few details on some of the equipment I use to ensure my customers a perfect boat repair, every time. 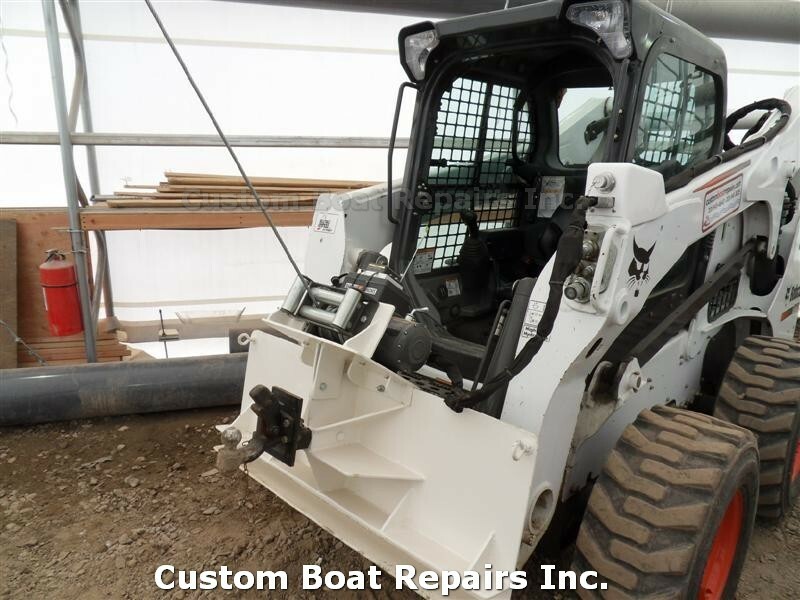 The first machine is a Bobcat S770, which is a fully loaded machine and super comfortable to run. I also have my older Bobcat 843 that I still enjoy running, until it rains or snows. My Bobcat 843 isn't enclosed like my Bobcat S770, which has heat and air conditioning! 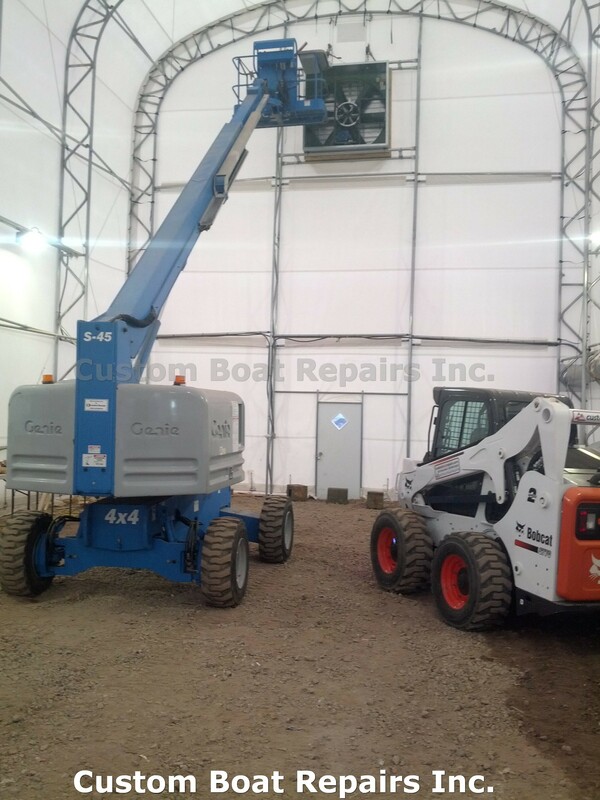 Then I have the Genie S45 Aerial Lift. I actually used ladders for a long time, but slipped off them too many times. This lift machine changed all that. At my second location, I had to install an exhaust fan by myself. It was 6-feet in diameter and weighed around 300 lbs -- huge! This fan had to be lifted 35-feet up, into a frame assembly that I custom built to hold it. In the photos that follow, you'll see how I used the Bobcat with a remote control winch, mounted on the front support to lift this fan, while I also used the Genie to follow the fan up into position. As you'll see in the pictures, this job was a complete success. 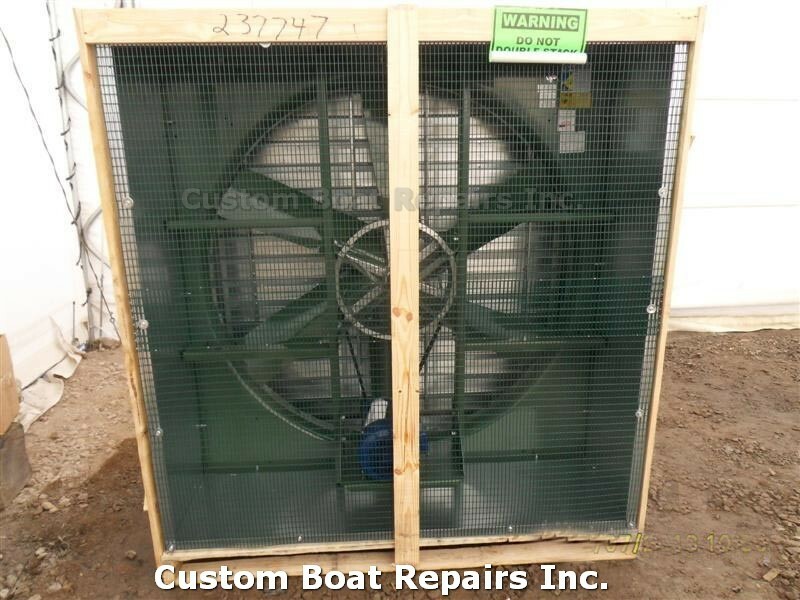 Here is the fan that needed to be hoisted 35-feet, into the custom-built frame assembly. This is the remote control winch, mounted onto the Bobcat that lifted the fan. Setting up the cables to lift the fan. The winch pulled the fan up into position. Locking the fan into position and removing the cables. I installed the outside shutters and tested the fan out, to make sure the shutters open properly. 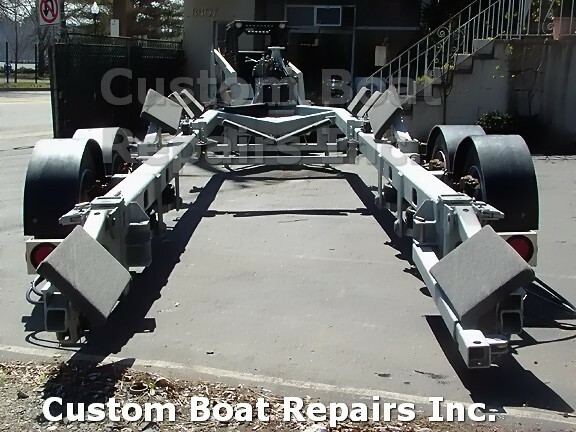 Rather than using independent boat haulers Custom Boat Repair has bought a new Hydraulic Boat Trailer. Other trailer services either don't work on the weekends or can't come right away. 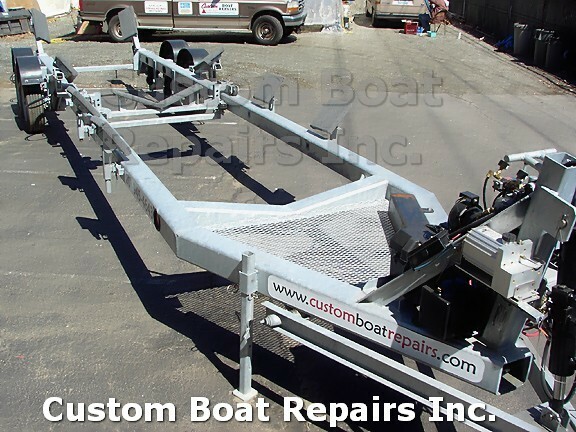 This can delay repairs for weeks and often times haulers don't stick to the price that you were quoted. 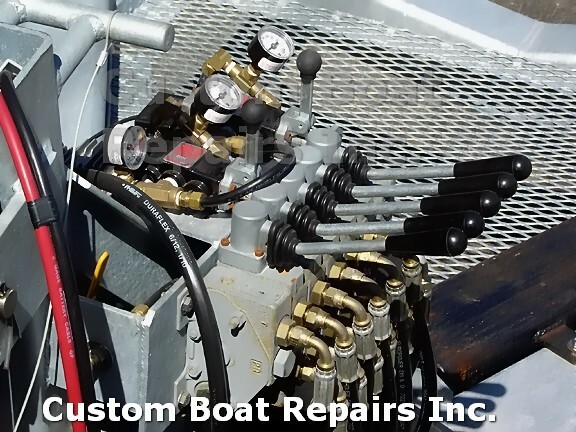 Custom Boat Repair believes that the customer always comes first and as a service provider you need to be available all the time. 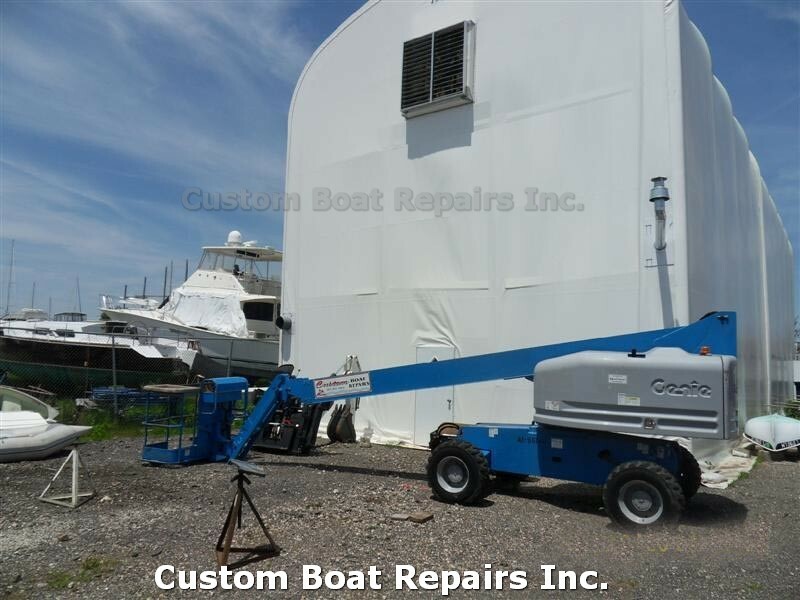 Custom Boats is Dedicated to customer service and makes those services available seven days a week 6:00 am to 10:00pm. 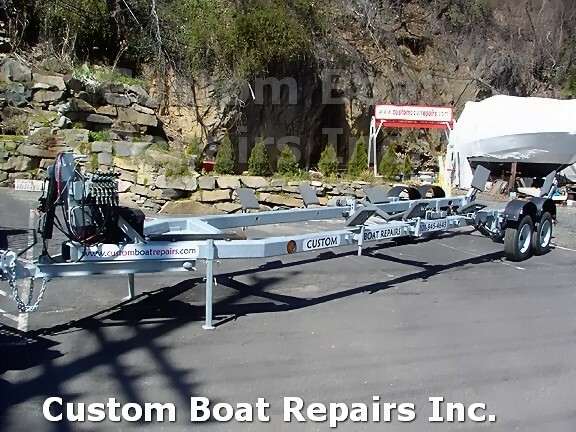 This New Hydraulic Trailer will handle a 34' boat, 18,000 Lbs. 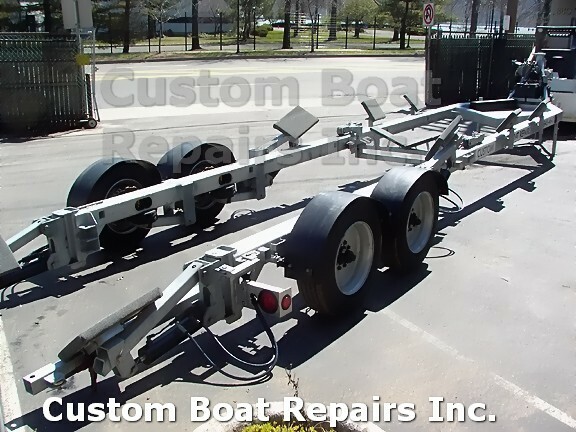 This trailer is also equipped with an Air Ride Suspension system. 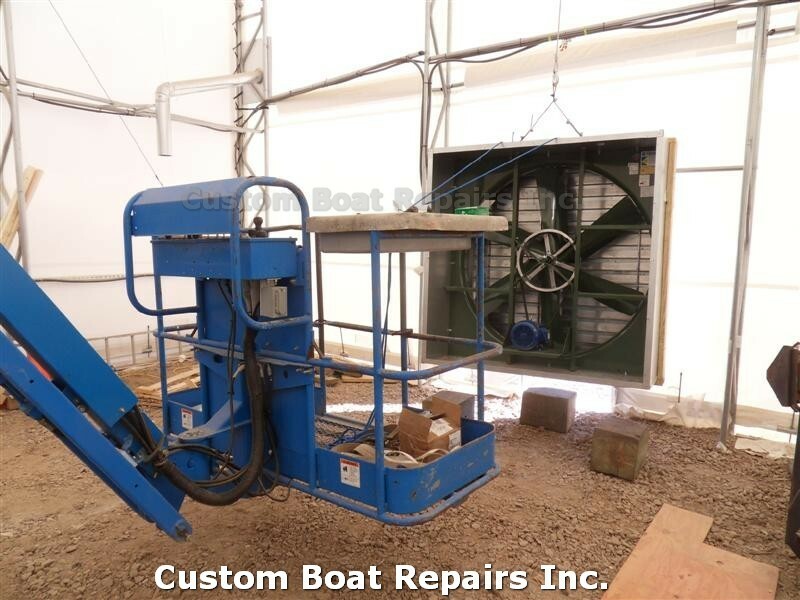 Some customer's boats can be hauled to the yard for free. 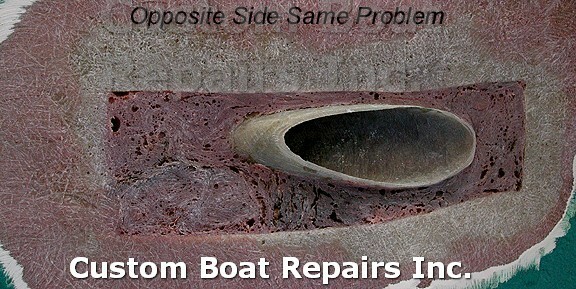 This is available for certain fiberglass repair jobs and will save customers money. 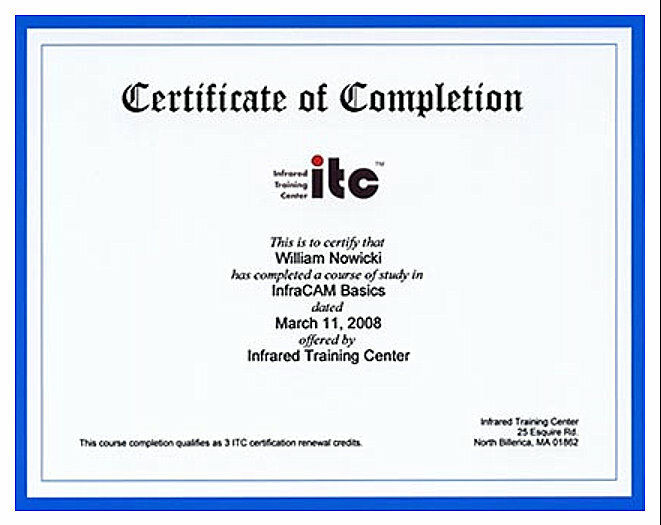 I purchased this Flir Thermal camera about ten years ago. Well let me say that this is one of the best tools that I ever bought. The first three pictures show this cameras capability. 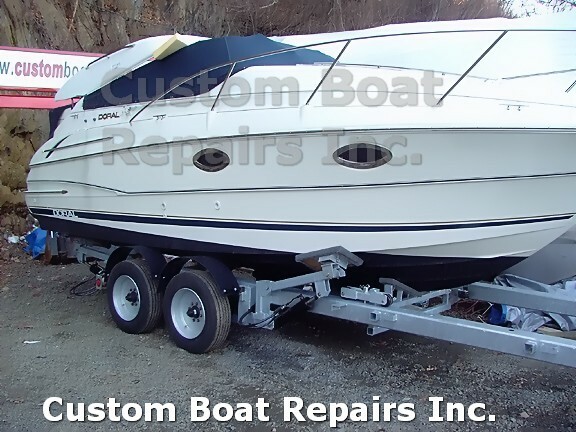 The photos are of a Sea Ray Boat. The area is the shaft log. This area is where the shaft comes out of the hull and then goes through the strut support. Water was leaking inside the boat. When the outside was checked you didn't see much, just old bottom paint on the hull. So I got my camera and took images of the area, and this is what it showed. 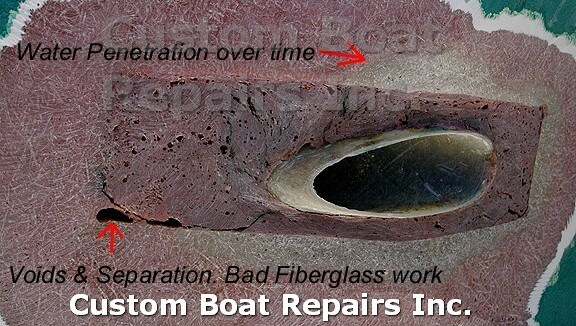 The dark areas show where the moisture is in the fiberglass, also fine stress cracks. You could not see these with your eyes. These show what the area looks like after I removed the Gel-Coat from the bottom of the hull. You can see how the factory fiberglassed that area in. 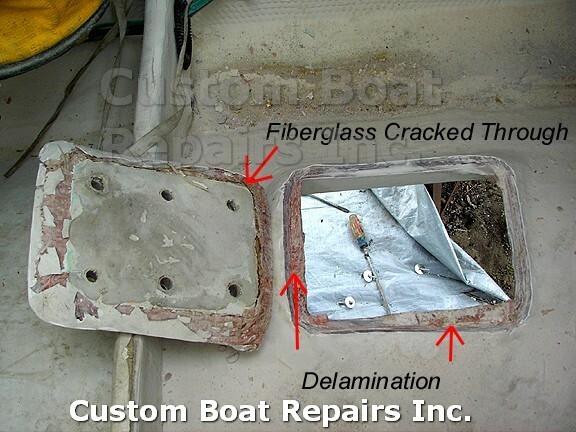 It looks like they cut a square section out clean, then fiberglass the inside area, then they lumped on the fiberglass on the outside. See all the voids? See the cracks? See the areas that are discolored? Water started to penetrate these areas. Eventually this area will get weaker if left alone. 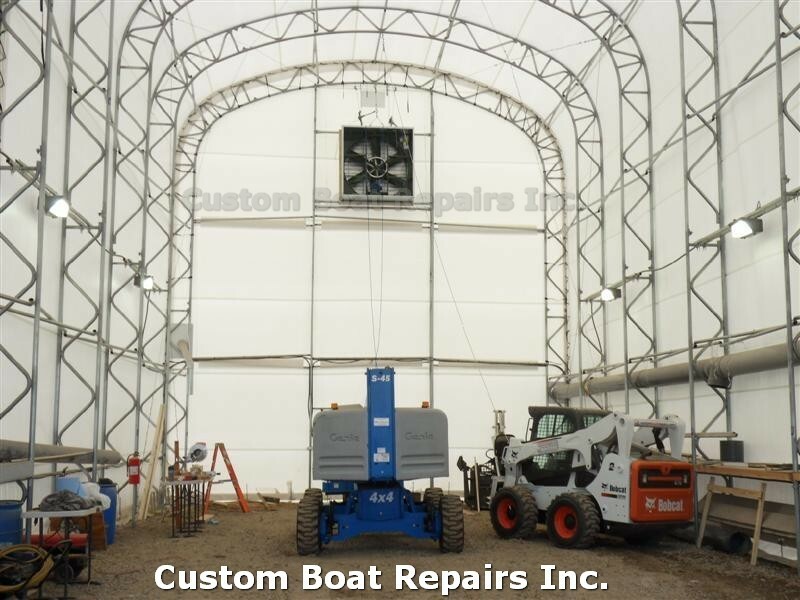 These pictures show a Strut support on another boat job. 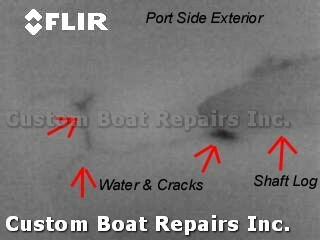 The dark areas are where water & the fiberglass are delaminated. 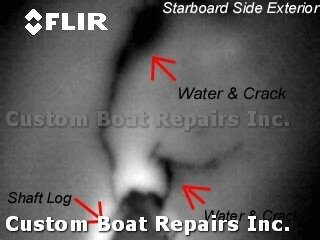 This photo shows what I found when I removed the fiberglass support plate. 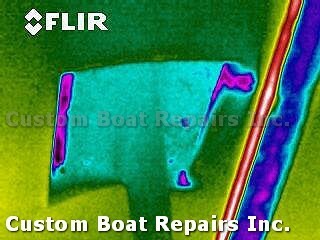 I feel its Very important if your buying a used boat to check out these areas with an infrared camera. 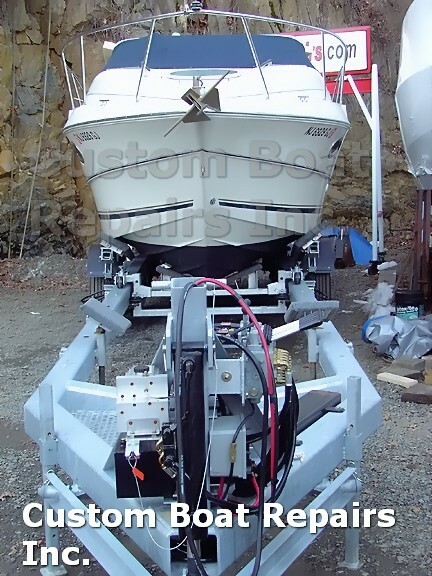 With a fresh coat of bottom paint on the hull you'll never find it. The camera will. Also to repair these areas is very expensive. Most of the time the motors will have to be removed. 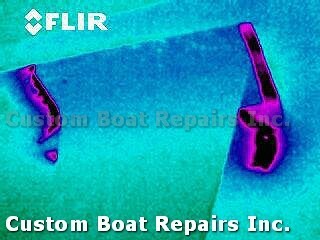 This is what the Flir Thermal Camera looks like. 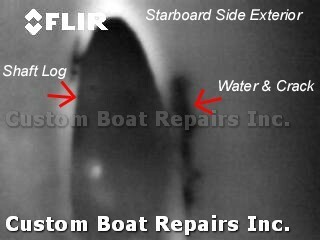 If you would like to see what this camera is capable of, click this link: Marine Surveying Article. This Flir thermal camera is so cool that a few customers asked me to check out their homes. One customer was selling his home and the home inspector noticed some water stains on the outside of his house. The inspector told the home owner that he will have to drill holes on the side of his house to see if the wood was wet. This customer was worried about losing a lot of money on his house. 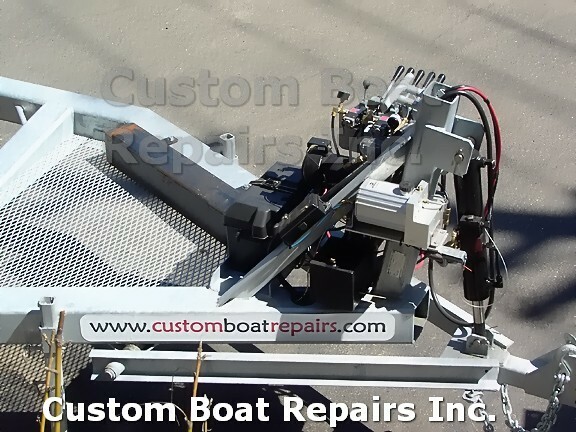 To do this type of repair was very expensive. So the customer called me to see if I could check it out for him before the inspector checked it out. I said sure. I put the camera up to the area and it showed the wall area was very dry. Other areas not associated with the area that was mentioned were questionable. I told the customer not to worry when the inspector checks out the wall, It'll be dry. Well the inspector checked it out the next day by drilling holes and putting a Moisture Meter into the wooden beams and like I said it was dry. The customer was so impressed with the tool, that he wanted to buy one until I told him the price. That camera cost me $15,000.00. Another customer got in touch with me about finding a water leak in his home. He told me that every time he put the heat on the leak would appear.This customer had a Radiant Heating system under his Granite floor. He felt that if the leak was in his floor he would have to rip up his new granite floor. This would be a Very Expensive job. I told him to fire up his heating system, after a few minutes I found the leak. Only one granite square had to be removed. I saved him his whole floor. If you need help with something that you think this camera will find get in touch with me. I'll try to help you out.